Most customers appreciated the intelligent cushioning system of Hoka One One Clayton 2. Many runners also noticed the light weight of the shoe; they were happy since it did not tire their feet during long runs. The customers commented that this running shoe got better with time; its upper adjusted to the shape of their feet and felt more comfortable. A few runners admired the responsive ride of Clayton 2. A user commented on the rubberized laces, which cinched down the shoe’s upper and prevented any sliding of the foot. A few customers mentioned that Clayton 2 had solved the blistering issue of Clayton 1; one such customer mentioned that Hoka One One had readjusted the design of the shoe’s upper and also placed a substantial sock-liner to solve the issue. A runner lauded the improvements in the upper; he liked how the shoe’s upper felt softer and more pliable during his runs. A few runners had apparently experienced blisters while running in the Clayton 2. A user was disappointed with the shoe’s perceptive lack of responsiveness; the midsole sucked the energy out of him with each stride. Hoka One One Clayton 2 is a light, well-cushioned, durable pair of long-race running shoes that offer a very comfortable, springy ride for its users. While this newer model solves the blistering issue of Clayton 1, some consumers felt that it took a while before completely adjusting to the feet. Generally, this neutral road running shoe was well-received by fans and newcomers. Okay, the title may be exaggerated, but if I had to choose only one pair of shoes for all of my training, I would choose the Hoka really designed that well. Hoka’s unique sole, Pro 2 Lite +10, makes the runner soar in all conditions. The massive 20mm of cushion protects the runner’s legs during long runs. The lightweight feel (9 oz for men, 7 oz for women) and the responsiveness under your forefoot, give you a boost during any speed workout and tempo run. The specially designed outsole, RMAT, is able to offer ultimate traction under any weather condition and terrain. And, last but not least, the Clayton 2’s soft air mesh upper takes minimum amount of miles to break in. The soft upper of Clayton 2 provides a seamless and good air-circulation condition in inside the shoe. While the soft material provides a good fit for your feet with minimum break-in mileage, the structural overlays around the midfoot area and the TPU Lattice material in the shoe’s front half provide a good integrity and durability of the shoe. The special Pro 2 Lite +10 midsole of Clayton 2, gives your feet more cushion around the heel area while maintaining a great responsiveness around the forefoot with a low heel to toe drop. Such transition of responsiveness gives runners the opportunity to choose between speed or cushioning just by shifting the strike. Also, even though Clayton 2 has a relatively soft upper, the high side walls of midsole takes the job of locking your feet in the shoe well. The outsole of Clayton 2, RMAT, is designed to provide exceptional grip, durability, and energy return in different terrains and weather conditions. Whether you run on wet trails or dry flat roads, the RMAT always grips well and stays bouncy even after hundreds of miles of running. It is also shocking to find that after running more than 400 miles on it, the outsole is not worn out at all! Hoka Clayton 2 is a very user-friendly shoe. Any beginner or experienced runner can harness a lot from it. While a thin, soft, upper is generally believed to provide little support, the sidewalls of the massive midsole wrap around your feet and lock them in, whenever you are ready to run. The Pro 2 Lite midsole transitions from responsive EVA foam under the forefoot to soft EVA foam around the heel. It will give you boost of speed on the uphills while forefoot striking, but the soft foam dampens impact very well when it comes to downhill. The RMAT sole provides great traction on wet, dry, grassy, rocky, concrete and trail surfaces. The design of Pro 2 Lite midsole gives you the opportunity to accelerate to your speed mode whenever you want, just by shifting your landing spot to the forefoot. The incredible energy return makes your speed workout sweet. At the same time, the huge cushioning gives you the opportunity to do a smooth long run on any day you want. The Clayton 2 is a good pair of shoes if you want to adjust your foot strike to a midfoot or forefoot strike since the midsole is capable of both running styles. The previous model of Clayton 2 had a widely reported issue of causing blister. This problem has mostly been solved in the Clayton 2, however, the sockliner sometimes still irritates the arch of my foot. Many runners have described Clayton 2 as a pair exceptionally durable shoe that can last an entire year of running. In my wear testing, the great responsiveness started to decline around 200 miles of intensive training, which is even slightly less durable than other shoes on the market. Clayton 2 is a pair of very well-rounded shoes. That is its biggest advantage, but it is also its most significant flaw. While it can work in any condition, it cannot compete with the top racing flats for road racing, nor it can be the top choice for trail running. It is a great pair of trainer for any type of running. If there is one pair of shoes you want to get to go through the entire season of training, it is the one to tackle all kinds of workouts with great energy return and cushioning. Also, if you have a forefoot strike or you are thinking about adjusting to one, Clayton 2 will work well for you. Pegasus 34 is another versatile shoe with a very responsive foam midsole. However, it lacks the quick transition that Pro Lite midsole provides. The 10mms heel to toe drop makes this shoe more suitable for heel striker. Also, despite Pegasus’s responsive midsole, its 1.1 oz heavier weight (10.1 oz) makes the ride less swift than Clayton 2’s. Another significant difference is the upper. Pegasus 34 has a much more structured upper than Clayton 2 does, especially in the heel cup area. Seemingly, it provides more support to fix your foot in the shoe. However, the heel cup gets really soft after 200 miles of running, after which, it does not support your foot well at all. On the other hand, Clayton 2 has a trough shape midsole, with high side walls to wrap your foot tightly against your shoes. Hoka Clayton 2 is a really well-made shoe for a wide variety of purposes. It has massive cushioning to protect your legs, but it is also very responsive, to boost your speed. The Pro 2 Lite sole is really the best part of the shoe. The Clayton 2’s light weight is amazing, considering it has 20 mm of cushioning. The sidewalls and transition of midsole density are features that are unique to Hoka’s. These features are very favorable. Anyone who wants a versatile shoe for all types of training should consider the Clayton 2. While it does all training in different condition well, it can not compete with shoes that are specially made for their purposes. For example, if you want to be number one in road races, a pair of specialized racing flats would be more favorable. Lastly, the durability is just not as exceptional as people said on the market. Its durability is mediocre as its compensation to the super lightweight. Hoka One One Clayton 2: Nearly perfect, fast paced daily trainer/racer! Let me just start off by saying I have been running in Hoka One One since 2012. I have run through 4 pairs of Stinson Tarmac, 2 pairs of Bondi, Huakas, and now the Clayton 2. I have gone from the maximally cushioned meta-rockers (when I was close to 200 lbs), down to their new faster line-up of shoes. I love the durability of Hoka shoes and have never had a pair last less than 400 miles. The Clayton 2 is no exception; it's lightweight, responsive, very durable, and still, have just enough cushioning for those long runs. When I first opened the box, I loved the colorway of the shoes, the blue and green really popped. The shoe was lightweight and looked fast. It made me want to go for a run right away and put these babies in motion. I laced them up and took them for a quick 5K. They felt good right out of the box, they were lightweight and allowed for a quick turnover. I quickly got up to my normal training pace and everything was going great. I am a neutral, midfoot striker, I run at a cadence of 180-200… this shoe was shaping up to be my new favorite shoe, up until mile 2. That was when I noticed a slight pain in my right and left arch. Being a glutton for pain as most of us runners are, I stuck it out and the pain continued to get worse until I finished my run. I pulled the shoes off and quickly discovered blisters forming. This was the first disappointment that I have ever had with the Hoka brand! I was ready to send them back, but I am glad I didn’t. That night I jumped on the forums and did a little research and found that others were having the same problem. Bummer, right… Not so fast… After reading more, I found that it could be fixed with a quick change of the insole. I switched it out with my old insoles from the Hoka Huaka, went for another run the next day. A simple switch of the insole turned these un-runnable shoes into my new favorites. As with all Hoka that I have ever tried, the quality of the shoe is top notch. The upper material is breathable and keeps the foot cool, even in the South Georgia heat and humidity. The sole is really where I fell in love with the Hoka brand, it has the PRO2Lite dual density midsole, which isn't the extreme cushion that Hoka is known for, but it is just enough cushioning to keep you going no matter what mileage you are running. It is a much more responsive ride when compared to the Hoka Bondi or Clifton. If you are like me and have switched to a midfoot strike, there really is no need for all the cushioning. The Clayton 2 also boasts the RMAT outsole which eliminates the excess weight of traditional rubber and provides exceptional durability. The toe box is wide and has plenty of room for your foot to splay naturally. I love the toe box! Both the midfoot and heel are very snug. I had no problems with either slipping during any of my runs. It has a 4mm heel-to-toe drop and my size 9 weighs in at 7.8oz. After switching out the insole, these shoes came alive and I was quickly running at or below my normal training pace (8:00/mile). This shoe went right into the rotation and quickly became my go-to shoe for all runs. I found myself choosing this shoe for pretty much all my training and racing activities. I have even been using it for speed work at the track, where I am running sub 6 min pace and this shoe holds up very well. The sole of the shoes shows very minimal wear for the miles that they have on them. I love that it is such a lightweight and responsive shoe. Currently, I have 427 miles on the Clayton 2 and I plan on taking them well past 500 miles. It is an amazing shoe, once you switch out the insoles. I have used them as a daily trainer and racer since February 2018. It is going to be a sad day when I have to retire these shoes because Hoka is not making this model anymore. They have continued the bloodline into their new Mach series, which I have yet to try. The only reason this shoe wasn't perfect was the initial insole problem. If you can find a pair for a good price, buy them and you won’t be disappointed. That's like super-sizing your cushioning at a super light weight package. I was pleasantly surprised that the grip stayed intact on both the road and the bike trails. The shoe utilizes the new Pro2Lite +10 in its midsole for high comfort and optimal performance for its users. Also, since it has an open-cell structure, it allows good circulation of air which keeps the runner’s feet cool and dry. This layer in the midsole is softer in the heel region for comfortability and firmer in the forefoot area for better hold. The new upper, with lattice thermoplastic polyurethane (TPU), wraps from mid-foot to toe section, ensures optimal breathability and a pressure-free fit for its users. 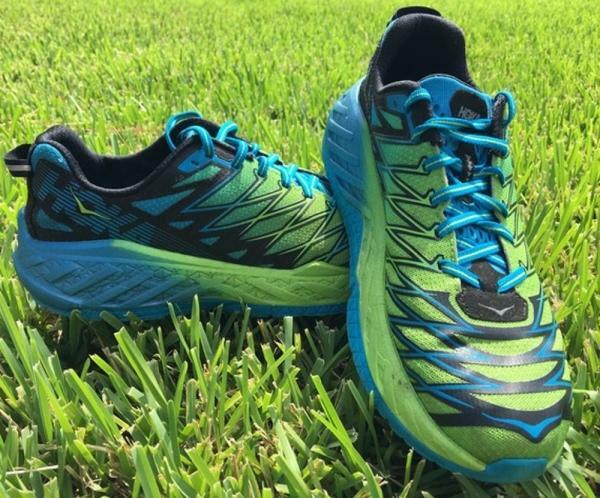 This newer version of Hoka One One Clayton 1 has fewer overlays and more mesh, which improves its upper in terms of fit and durability. An updated sock liner, which proves to be an effective measure for the prevention of blisters, is also placed in the shoe. The new more substantial sock liner wicks away the moisture from the feet and ensures instant cooling and drying. The Clayton series is known for its design that is intended for daily road runs. A similar shoe that is worth comparing is the Altra Paradigm 4.0, which is also a low-drop running shoe with a high stack height like the Clayton 2. The Clayton 2 from Hoka One One has a standard running shoe length. It stays true to size for a person with medium sized feet. It is available in the medium width for both the men and women’s versions. The shoe boasts increased traction and better performance on a variety of surfaces owing to its effective feature of ‘Full Ground Contact’ which helps the runners in ensuring a firm grip on both dry and wet terrains. It also has the RMAT material in its outsole- a new type of injection rubber which is not only environmentally friendly but also has a high energy return. Hoka One One claims that the material is durable and exhibits excellent traction on various surfaces. The Clayton 2’s midsole has the layer of Pro2Lite+10 which is more cushioned in the heel area and firmer in the shoe’s front. This ensures both the optimum cushioning and the efficient grip of the shoe. The mid-sole also has the Early Stage Meta-Rocker Geometry—a setup which utilizes a low heel-to-toe differential and ensures a faster transition to the forefoot during sprints for the professional runners. Clayton 2 features the air mesh upper, which aims to deliver effective circulation of air. It also has a ‘no sew’ constriction, a design that provides a seamless environment inside the shoe. The structural integrity of the upper is ensured through overlays around the midfoot area. The intelligent placement of these structural overlays results in a snug and comfortable fit for the user. The midfoot area is further enhanced with the help of Microfiber reinforcements. The upper also has the TPU Lattice material in the shoe’s front half. These add-ons not only consolidate the overall structure of the shoe, but also fit comfortably around the user’s foot during longer runs.